There are several proven methods to reduce radon in your home, but the one primarily used is a vent pipe system and fan, which pulls radon from beneath the house and vents it to the outside. This system, known as a sub-slab ventilation system, does not require major changes to your home. Sealing foundation cracks and other openings makes this kind of system more effective and cost-efficient. Similar systems can also be installed in houses with crawl spaces. The cost of reducing radon in your home depends on how your home was built and the extent of the radon problem. Most homes can be fixed for about the same cost as other common home repairs. The average house costs about $1,200 for a contractor to fix, although this can range from about $800 to about $2,500. The cost is less if a passive system was installed during construction. Lowering high radon levels requires technical knowledge and special skills. New England Radon has been mitigating homes in New England for over 20 years. We offer free estimates from highly trained and experienced proffesionals. Our systems are desighned specifically for your home and are guaranteed to reduce radon levels to below 4 pCi/L. After a system is installed, we provide a test kit and analysis to be sure that the radon levels have been reduced. The EPA recomends to retest your home every two years to be sure radon levels remain low. Note: The diagram is a composite view of several mitigation options. 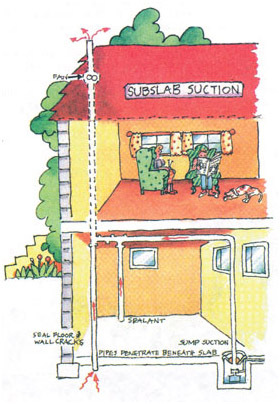 The typical mitigation system usually has only one pipe penetration through the basement floor; the pipe may also be installed on the outside of the house to reduce cost.